Borrowers who think they could be relocating in the near future, or need to shore up savings, might want to consider what some regard as the next best thing. WITH interest rates at historically low levels, the vast majority of borrowers are finding value with a reliable fixed-rate mortgage. But borrowers who think they could be relocating in the near future, or need to shore up savings, might want to consider what some regard as the next best thing: an adjustable-rate mortgage that offers several years at a fixed interest rate. These hybrid adjustable-rate mortgages, or ARMs, originated in the jumbo-loan marketplace at the end of the 1980s. But they fell out of favor — along with the riskier ARMs with ultralow teaser rates and interest-only components — after the subprime mortgage crisis. Some adjustable-rate mortgages have an interest rate that changes every year, but a hybrid — also known as a delayed first-adjustment ARM — has a fixed interest rate for a period of time. In fact, most loan officers refer to a hybrid by the period during which the rate is fixed. A 5/1 loan, for example, has a fixed rate for five years, then adjusts annually for the remainder of the term; a 7/1 adjusts after seven years. A common reason for choosing a hybrid ARM is projected length of homeownership: it’s a nice option for buyers who don’t expect to stay in their home for longer than, say, three to five years, perhaps because they anticipate transferring to a new city or starting a family. Rates on hybrid ARMs are also attractive. As of Thursday, for example, the average rate on a 5/1 loan was 2.81 percent in the Northeast, compared with 3.88 percent for a 30-year fixed-rate loan, according to Freddie Mac. The interest rate is often tied to rates on Treasuries or to an index, like the London Interbank Offered Rate, or Libor. “We continuously have interest in hybrid ARMs, especially in the jumbo marketplace, where there’s a huge rate differential,” said Melissa Cohn, the president of the Manhattan Mortgage Company. The rate on a 5/1 ARM could be as low as 2.5 percent, according to Ms. Cohn, while a 30-year fixed-rate loan costs 3.75 percent. So if you took out a $300,000 loan, you could save almost $4,000 a year with the hybrid ARM, she said. She noted that the difference was even larger with nonconforming jumbo loans. A word of caution to borrowers, however: With rates starting at rock-bottom levels, there’s generally only one direction for them to go. 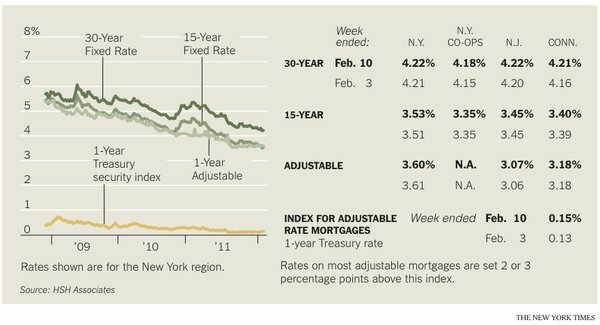 And even though there are caps on the rate change amount, the jump could be as much as six percentage points.